Come and Celebrate Worldwide Quilting Day with us this Saturday. We will have a drawing for a Gift Card and Gift Basket. Aslo, many specials to celebrate the day! For those of you participating in the Blessings of Christmas Night, Blessings of Autumn and Little Blessings Wallhangings, come and join us for a sew in night. This will give you uninterrupted time to complete your blocks every month and give you tips and pointers for machine applique. Free to to those who have purchased the BOM's and Little Blessings kits. 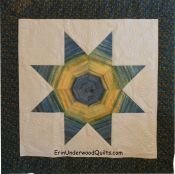 **Don't forget that the Beginner Quilting Classes are still going on this month as well as Baltimore Album Basics! **Our Sew in Days are Tuesdays and Fridays every week. Come and join us from 10-5! 6 hour workshop Have no idea what to quilt where... Don't understand the difference between stippling and meandering... Tired of stitching in the ditch... and does every little quilting line have to be marked? Get the answers to these and many other perplexing quilting question while you learn the ins and outs of machine quilting. String Bling 61” x 84” Scrap-friendly quilt! Use your stash to create fabric with Bling! Then cut your diamonds and watch them shine! And because the strips are all cut at different widths, thereâ€›s not a lot of seams to match!